Whether you are a dancing novice or an old pro, there are only a few basic rules that you should know to properly navigate a dance floor in North America. This holds true for both ballroom and country dance floors. When you want to travel (Waltz, Fox Trot, Two Step, Tango, etc. ), move in a counter-clockwise direction around the floor. 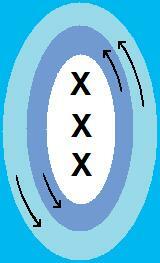 Faster traffic should stay to the outside of the circle, while slower traffic should stay to the inside of the circle. When you want to stay in one spot (Jitterbug, Swing, most Latin dances), move towards the center of the dance floor to stay protected and out of the way of the dancers who choose to travel. If you accidentally bump into another dancer, immediately smile and apologize. We all do this now and then. While we each have our own ways of moving to the music, you may find yourself wanting to know how to move to each style of music in a more comfortable and predictable manner. If so, we suggest you take a few dance lessons with a local instructor. They can do wonders for both your ability and confidence, while at the same time give you a social activity that you can enjoy your entire life.